A Chilli Mandragora that has produced a mushroom from spores. 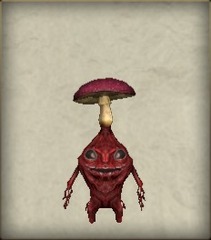 It is quite unusual to find adult mushroom specimens that can endure the inherent toxins. It is usually found in the wild with its roots growing in underground ores and minerals. Those with roots in gemstones are deemed to be particularly valuable; apparently they will turn out to be beautiful specimens that reflect the colours of the gemstones.